It’s all about perception and couples are looking for photographers who will go the extra mile. Sometimes the resulting referrals that can come from word of mouth is definitely worth the decision to make that little bit of effort. One of the latest trends we have noticed is that couples want to have some personalised memory of their Big Day. A great idea and something we have seen a big call for is that of a ‘Signature Frame’ which is basically a frame and fitted mount around a photo of the couple. 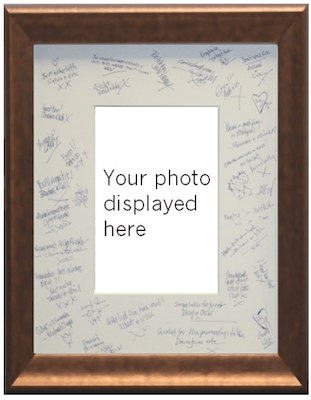 No glass is fitted so the wedding guests can leave a written message at the reception. You can find these on the internet – the ones we liked were from Cadremont who supplied the frame and mount and at the time of writing this were offering a buy 2 get one free type offer across their range. Hopefully as the wedding season starts to get into full swing , making that little bit of effort will start to pay dividends.